It is healthy to turn to this speech last year by the late David Lange, former PM of New Zealand (Sirdan met him, by the way), especially in the light of John Howard’s announced receipt of the Woodrow Wilson award, and Peter Costello’s comments on anti-American teachers. Although I was asked here to talk about peace, I am not what could be called a pacifist. I think that, like individuals, societies and nations have the right to defend themselves from attack. I think for example that the government of Kuwait was entitled to call for military assistance when it was invaded by Iraq in 1990. I think that this country, New Zealand, was right to identify itself with the victims of aggression as it did in 1939 when it declared war on Germany. I am just as sure that there must be limits on the use of force. The use of force can only be justified if it is in proportion to the threat which is offered. Tomorrow is the anniversary of an attack which in my mind cannot be justified, and that is the bombing of Hiroshima. Like the bombing of Nagasaki, it was done to make a point, and the harm done was out of all proportion to the threat. I see no justification for the terrorist attacks of September 2001. They are a crime against humanity. The Bali bombing was no less an outrage. There is no justification for the murder of the innocent. The government of the United States, and the government of Indonesia, had a duty to pursue the people who were responsible for these terrorist crimes. The Indonesian government has had some success in bringing the murderers to account. The Americans had a harder task. It is the American response I am going to talk about tonight. Thousands of people have attended a memorial service and barbecue at an Auckland sports stadium to celebrate the life of former New Zealand prime minister David Lange. 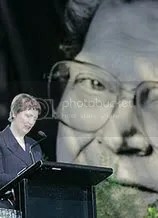 New Zealand Prime Minister Helen Clark said all people who had met him, even those who had crossed swords with him, acknowledged Lange was “an extraordinary man”. Mr Lange has been lauded as the architect of New Zealand’s 20-year-old nuclear-free policy and a bold reformer who transformed the South Pacific nation’s economy. “His vision saw our small country stand up for big ideas and values critical for the survival of humankind,” Prime Minister Clark told the audience of more than 2,000. Rear Vision Program 2 of 6 : Papua New Guinea: Nation State or Failed State? Comments Off on Rear Vision Program 2 of 6 : Papua New Guinea: Nation State or Failed State?